Positioned as the spine of South America, Chile has one of the longest coastlines in the world. Between its exotic landscapes, food, and music, there is a deluge of opportunity to be found. The swell of its growing economy has made Chile more than a tourist attraction. Each year, thousands of businesses and individuals from all over the world choose Chile as their next destination. This is no exception when it comes to Canadian businesses and individuals. Pursuing these opportunities naturally requires the use of some Canadian documents. These can include corporate documents such as Certificate of Pharmaceutical Product, Good Manufacturing Practice certificate, Site License, Certificate of Free Sale, Certificate of Incorporation and Articles of Incorporation, and personal documents such as birth certificates, marriage certificates, degrees, transcripts, diplomas, and RCMP police check. Unfortunately, it is not as simple as merely sending them to Chile. Documents that are issued in foreign countries need to go through a process of validation to ensure they are real. 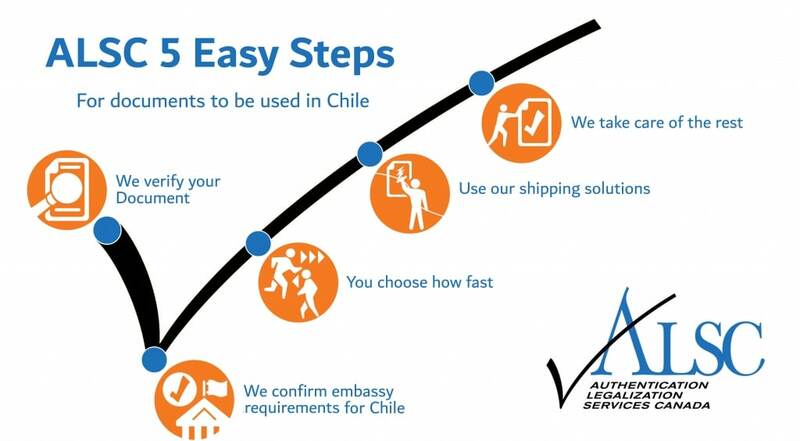 Chile uses the apostille process which you might have heard about or are even familiar with. However, Canada has not signed the Hague apostille convention. Therefore, it uses the original two-step process of authentication and legalization. Once your Canadian documents have been authenticated and legalized in Canada, they will require further legalization at the Ministry of Foreign Affairs of Chile in Santiago to be recognized as valid within the country. This is true regardless of the Canadian documents you need to use in Chile, so keep this in mind when you plan and prepare for the process. Authentication and legalization is simple: it involves verifying the signatures of certified individuals. Depending on the type of document, this process usually begins with a lawyer or notary public. These signatures as well as those on various vital statistics documents, educational documents, and RCMP police checks are recognized by Global Affairs Canada, which is where the first step of authentication takes place. Authentication can take as long as 20 business days for documents received by mail. This is in addition to processing time at the Embassy of Chile here in Ottawa, which also requires a series of requirements and fees for them to legalize your documents; the second step. These fees and requirements change frequently, which makes legalization the most difficult step of the process. It is no surprise then that it is unlikely you will succeed in having your documents authenticated and legalized on the first try. In fact, it is very common that delays occur even if you have gone through the process before. Waiting over a month to have your documents processed is simply not an option, especially if you are a Canadian business with deadlines that need to be met in Chile. This is why thousands of Canadians choose to use our services every year. We served our first client over 25 years ago. Since then, we have helped tens of thousands of Canadians with their affairs in Chile and elsewhere around the world. Authentication and legalization is in our name for a reason: we are the first company to provide this service and have consistently proven ourselves to be the best in our industry. We offer 3 different authentication speeds that save you time: same day priority, 3 day standard, and 10 day economy. Each is designed to meet your document needs, balancing affordability, speed, and convenience. When you choose to use our services, our experts help you prepare your Canadian documents for authentication and legalization for use in Chile. You will receive detailed updates every step of the way, and your personal agent will be there to answer any questions you have throughout the process. Upon completion, we can ship your documents anywhere in the world they need to go via one of our many trusted shipping partners. The result is a seamless, stress-free authentication and legalization process with minimum delays, saving you up to 20 days of processing time. If you have Canadian documents that need to be used in Chile, contact us. If you are rushing to meet a deadline we recommend you do so immediately. Continue reading for helpful information on various Canadian documents for use in Chile, how to get them, and how we can help process them for you. Chile’s economy has become an attractive destination for many industries, particularly those in the pharmaceutical field. Each year, hundreds of Canadian businesses need to renew their product licenses, modify existing subsidiaries, or choose to partner with Chilean corporations. If this is you, it is likely you have Canadian corporate documents such as CPP, GMP, Site License, Certificate of Free Sale, Corporate Power of Attorney, Certificate of Incorporation, or Articles of Incorporation that have been requested from you for use in Chile. The exact documents you will require depend entirely on what was requested of you by your affiliates in Chile. We strongly recommend that you clarify exactly which Canadian documents you require for use in Chile to ensure you meet your deadlines. As an existing Canadian corporation, it is likely you have most of these documents at an accessible location or know how to draft them yourself. There are some corporate documents which are difficult to have reissued or cannot afford to be lost or damaged. In these cases we recommend you have notarized copies made. Many of our clients choose to have this done and we can do this for you when you use our services. Regardless, your corporate documents will require the signature, seal, and stamp of either a notary public or lawyer. As you may already know, lawyers can also draft documents such as corporate powers of attorney for you at an additional cost. If you require a commercial invoice or certificate of origin, the Canadian Chamber of Commerce here in Ottawa offer a “Trade Cert” Certification Made Simple service. 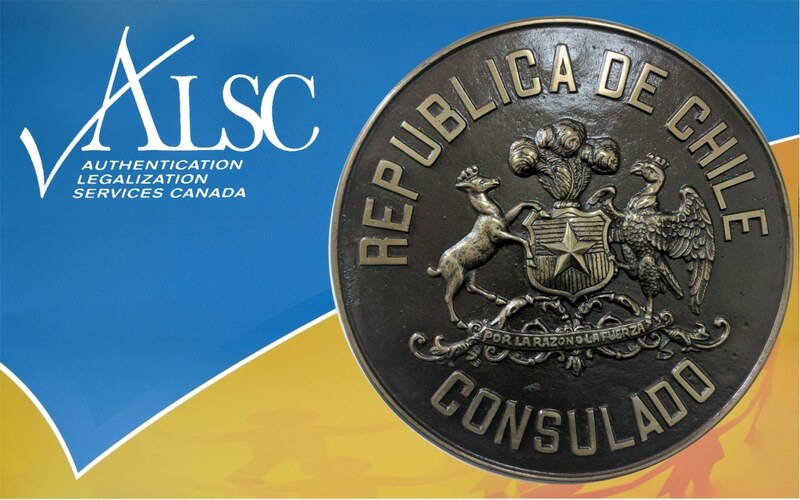 The signatures from the Canadian Chamber of Commerce are also recognized by Global Affairs Canada, making them valid for authentication and subsequent legalization at the consular section of the Chilean embassy. As proud members of the Canadian Chamber of Commerce, we can pick up your signed documents from their office free of charge for processing. We can even process your completed Commercial Invoices and Certificates of Origin if you send them to us via email. If you are interested in any of these two options, please let us know when you contact us. Many of our clients choose to do this as it saves them valuable time. Another document which you may require for use in Chile is a Canada Revenue Agency Certificate of Residency for Tax. Also known as a CRA Tax Letter or CRA Certificate of Residency, this document minimizes and in some cases eliminates Canadian taxes on any income your company will make in Chile. If you already have your CRA Certificate of Residency, make sure it has been properly notarized by a Canadian lawyer or notary public. If you do not currently have your CRA Residency Certificate for use in Chile, you can acquire one by following the processes outlined here. Remember that it will require notarization to be valid for authentication at Global Affairs Canada. Also keep in mind that, as mentioned earlier, once your Canadian corporate documents have been authenticated and legalized by the Chilean embassy here in Ottawa, they will need further legalization at the Ministry of Foreign Affairs of Chile in Santiago. You will have to coordinate this step on your own. If you have a Canadian birth certificate, marriage certificate, or death certificate that needs to be used in Chile, you’re in luck. Canadian vital statistics documents are some of the easiest to process since the signatures on those documents are recognized by Global Affairs Canada making them ready for authentication and subsequent legalization at the Chilean consulate in Ottawa. There are only a few things to keep in mind. The first is that Global Affairs Canada cannot process short form or wallet sized vital statistics documents. The second is that for marriage certificates and death certificates, they must be issued by the provincial vital statistics department and not by the church or by the funeral home, respectively. These cannot be processed even if they are notarized. The third is to remember that once your Canadian vital statistics documents have been authenticated and legalized in Canada it will require further legalization at the Ministry of Foreign Affairs in Santiago, Chile. If you currently have your Canadian birth certificate, marriage certificate, or death certificate then you are ready for authentication and legalization for use in Chile. If you do not have your Canadian vital statistics documents and need to order your birth certificate, marriage certificate, or death certificate, refer to the useful links below. Remember that you must order them from the province in where the life event occurred and not the one in which you currently live. If you require a divorce certificate or divorce judgement, you will have to contact the court which finalized the divorce and request a copy from them. If you need to order you Canadian birth certificate, marriage certificate, death certificate, or divorce certificate, we recommend you have it shipped directly to our office to save you time. As a location teeming with employment opportunities and renown post-secondary institutions, there are many cases where your affairs in Chile will require presenting Canadian educational documents such as degrees, transcripts, or diplomas. Similarly to Canadian vital statistics documents, most educational documents, most notably degrees and transcripts, contain signatures which are recognized by Global Affairs which makes them valid for authentication. However, degrees are valuable documents and you may prefer that it is not damaged or altered by the process of authentication and legalization. Indeed, due to their often larger sizes, degrees tend to become damaged as they are handled by couriers and staff at the embassy. As such, many of our clients choose to have notarized copies made of their university degrees, and occasionally other educational documents as well. We can do this for you when you use our services. We also provide free protective shipping for all out clients regardless of the service speed, ensuring your university degrees and other documents are kept in as perfect a condition as possible. Prior to notarizing your degree yourself or sending it to us for notarization and processing, make sure you have checked with the requesting party in Chile if a notarized copy will suffice. There are some cases where employers and post-secondary institutions will only accept original Canadian university degrees and educational documents. If you do not currently have your Canadian university degree, many universities allow you to purchase reissued degrees or certified copies from the registrar’s office at an additional cost. If you need to do this we strongly recommend you have your university degree shipped directly to our office especially if you are currently located abroad. This can cut significant processing time. Use the links below to order your Canadian university degree. Preparing your Canadian documents for use in Chile can be very stressful and time consuming. There are numerous things which can go wrong at every step of the way, and each mistake can add weeks to your processing time. At ALSC, we have spent over two decades mastering our trade. Our countless 5-star reviews on Facebook and Google, our esteemed membership with the Canadian Chamber of Commerce, and our A+ rating with the BBB makes it clear that we are the best at what we do. We ensure minimal delays and maximum efficiency, promising you one of the most stress-free and professional services you will ever encounter. In recent years we have worked hard to make ourselves the most accessible service provider in our industry. With over a dozen service centers across major cities in Canada and with more to come, we proudly hold that title. These service centers allow you to drop off your documents for processing at our head office here in Ottawa. You receive free priority shipping by FedEx upon drop off and for pick up. Should you choose to send your completed documents elsewhere, we can do so for you via one of our many shipping partners at an additional cost. Either way, you save money and time. Before visiting one of our service centers in Edmonton, Regina, Halifax, Vancouver, Winnipeg, Toronto, North York, Mississauga, Victoria, Surrey, Calgary, or Montreal make sure you have made an appointment with us through our head office. If you have Canadian documents that need to be used in Chile, don’t waste your valuable time. Get started with the experts by clicking below!